5th September 1908 aged 85 Years. 1. Hugh GRAY died in December 1801. He was buried in Kirkbride Churchyard #23.
and JEAN McCONNEL who died April 1810. 3 ii. Agness GRAY was baptized on April 27, 1767 in Parish of Maybole, Ayrshire. 2 She has reference number Twin. 6. 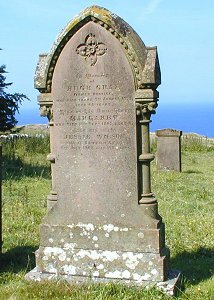 William GRAY (Hugh-1) was baptized on March 11, 1773 in Parish of Maybole, Ayrshire.5 He died on December 19, 1848. He was a Farmer. He was buried in Kirkbride Churchyard #22. Australia 18th February 1852 aged 33. +8 i. Hugh GRAY (born about 1812). 8. Hugh GRAY (William-2, Hugh-1) was born about 1812. He died on August 7, 1873 in Shanter, Kirkoswald, Ayrshire.10 He was a Farmer, Bogside. He was buried in Kirkbride Churchyard #28.
who died at Doonholm, Girvan 5th September 1908 aged 85. 11 i. Elizabeth (Eliza) Wilson GRAY was baptized on April 17, 1854 in Parish of Kirkoswald, Ayrshire. 12 ii. William GRAY was born on August 15, 1858 in Parish of Kirkoswald, Ayrshire. He died after 1908. He was a Farmer, Shanter. 13 iii. 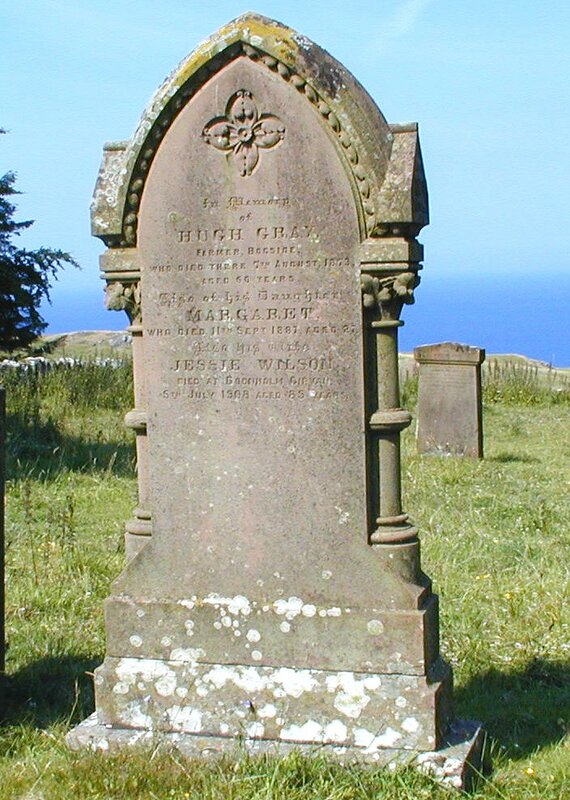 Margaret GRAY was baptized on May 2, 1860 in Parish of Kirkoswald, Ayrshire. She died on September 11, 1887. She was buried in Kirkbride Churchyard #28. 14 iv. Hughina GRAY was born on August 8, 1866 in Parish of Kirkoswald, Ayrshire. 15 v. Charles Robert GRAY was born on August 25, 1868 in Parish of Kirkoswald, Ayrshire. 16 vi. David Wilson GRAY was born on December 20, 1870 in Parish of Kirkoswald, Ayrshire. 1. Old Parish Registers of Maybole PAGE: Fr. 214. 2. Old Parish Registers of Maybole PAGE: Fr. 234. 3. Old Parish Registers of Maybole PAGE: Fr. 234. 4. Old Parish Registers of Maybole PAGE: Fr. 243. 5. Old Parish Registers of Maybole PAGE: Fr. 259. 6. Old Parish Registers of Stewarton PAGE: Fr. 310 & 487. 7. Death Certificate #136 of 1863 at Partick, Lanarkshire. 8. Memorial on stone #22 in Kirkbride Churchyard. 9. Old Parish Registers of Kirkoswald PAGE: Fr. 433. 10. Death Certificate #17 of 1873 at Kirkoswald, Ayrshire. 11. Old Parish Registers of Dalrymple PAGE: Fr. 307. 12. Death Certificate #47 of 1908 at Girvan, Ayrshire.